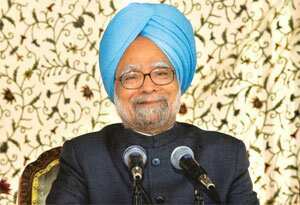 Srinagar: Prime Minister Manmohan Singh said on Thursday there were no no preconditions for talks with Pakistan, but it cannot make headway unless there is “effective control" of the terror groups operating in that country. Winding up his two-day visit to the Kashmir valley, he also voiced the hope that separatists and others would reciprocate his appeal for a dialogue with all sections of the people of Jammu and Kashmir. The announcement of the troop movement came as Singh said the security of the state must rest in the hands of the police. “The responsibility for maintaining law and order in the state will be increasingly devolved on the Jammu and Kashmir police," he said. Violence is now at its lowest in Kashmir since a separatist insurgency against Indian rule in the region broke out in 1989, but officials say incidents of “infiltration" of militants from Pakistan have risen over the past few months. “I believe that a new chapter is opening in the peace process in the state and we are turning a corner," Singh said. “We are willing to engage in serious discussions with every group, provided they shun the path of violence," Singh said as he announced a series of economic measures to boost the region’s economy. About the growing problem of Maoist unrest, Singh said the country plans to speed up economic development in an effort to counter the extremists. He said the government needed to resolve the underlying problems that led the poor in villages across central and south-west India to supporting extremist groups. “There is an alienation of the people, especially in tribal areas," he said. The rebels, known as Naxalites, have been fighting the government for more than three decades, demanding land and jobs for farm labourers and the poor.